Well, there’s really no denying or even downplaying the issue now, is there? Eldrazi is horrifyingly broken. Not only that, but it’s occupying metagame shares that are unprecedented in the history of Modern (as far as we have data for anyway). And this confuses me. It really does. Looking at this deck on paper, its success should not be. At best, it appears to be a glorified, undercosted Zoo deck that lacks reach. And yet, we have the Pro Tour and StarCityGames Louisville to show us how wrong that is. What is going on? Sheridan will be in tomorrow with a crisis report on the metagame, and while I know the numbers are will likely be met with the odd mix of begrudging acceptance and exasperated rage that any discussion of the current metagame generates in the Modern community, to me it’s just mystifying and demands answers. Yes, when Eldrazi, particularly UW, is firing on all cylinders, its overwhelming power is obvious. However, when that deck clunks it is shockingly clunky. 3/3’s for three and 2/1 fliers with upside for three were not great in Modern prior to this deck for a reason. But getting them out way too early suddenly makes them broken beyond measure. Like I said, this deck is fundamentally colorless Zoo but better, so there has to be something else going on. I’ve been thinking about the problem for quite some time, and I think I have the answer, but to make it understandable we’re going to have a history lesson. Take your seats and pay attention, there will be a test later. And I don’t give retakes! If you’re new to Magic in the past few years you may never have heard of Mike Flores. If you have, it’s only through his giveaways on TCGPlayer, or his doing features for the Wizards site. Dinosaurs like me, on the other hand, remember that he wrote some of the most fundamental (and comprehensible) theory pieces in the history of Magic writing. Everyone knows about Who’s the Beatdown? (and if you haven’t read it, do so now) but nobody seems to remember his equally important Finding the Tinker Deck. This piece articulates the basic archetypes of Magic and how they relate to each other at a fundamental level, why you rarely see anywhere else, and, when you do, why they’re borrowing heavily from Flores’ work. If you don’t understand it then my upcoming discussion of Eldrazi will make no sense, so don’t read any further until you finish that article. I’ll wait. I’m serious, if you’re reading this and you haven’t read Finding the Tinker Deck, click on the link and read it. Done now? Really?! Ok good, let us begin. Yes, the specific examples in the article are very dated (Storm is probably its own category today), but the principles are still sound. Counter-Sliver decks play cheap threats and protect them. Necro decks use powerful card-drawing engines to overwhelm opponents with cheap spells. Prison decks lock down the board. Sligh combines a superior mana-curve with late-game reach. Stompy uses cheap but large creatures and mana denial. Weissman answers everything. Toolbox has efficient, repeatable tutoring to find a bullet for everything. Tinker accelerates out big spells, and “The Enigma” are the mistakes Wizards made. There can certainly be overlap: our Modern Zoo example has elements of both Sligh and Stompy, while Modern Merfolk combines Stompy and Counter-Sliver (the Legacy version is almost pure Counter-Sliver, by comparison). Now that we have our definitions established, we can ask about where does Eldrazi lie? For simplicity’s sake, I’m going to lump all the Eldrazi decks together since the core of the deck (the 20-some colorless creatures and Eldrazi lands) never changes. The deck is clearly a Tinker deck in the same way as Fires or The German Dragon was. It plays powerful accelerants into expensive, even more powerful threats. Here are our first two clues: Eldazi’s payoff spells are already undercosted, and its accelerants avoid the traditional Tinker weakness by being lands. I don’t think I’m being too controversial by saying Eldrazi Mimic, Thought-Knot Seer, and Reality Smasher are all undercosted. Endless One is kind of nebulous, since there’s some history of X/X creatures for X being fine, though context matters. Smasher has too many abilities for its cost. Seer’s power and toughness are too high for an upgrdade Vendilion Clique. Mimic’s cost may be fine, but its costing generic and not colorless pushes it over the top. This brings me to the lands. The traditional Tinker deck was always very powerful, but was at risk of drawing the wrong mix of accelerants and threats (or worse, drawing them in the wrong order). It was frequently its own worst enemy. Look at Tron, another powerful land-based Tinker deck, which has a small number of bombs surrounded by land search. If it fails to draw a Karn or Wurmcoil (or, frequently, several) the deck does nothing because it had to give up so much to make its acceleration work. Now look at Eldrazi. Unlike the other mentioned decks that need multiple accelerants to assemble, it only takes one Eldrazi Temple to get the deck going and one Eye of Ugin to make the deck broken. A single Eye can generate six mana on its own per turn, easily generating four, and it can even tutor for more creatures. Compared to the original Natural Order or Tinker, there’s no risk to this acceleration package and no way to answer it before the damage is done. In many ways, Eldrazi is the ultimate triumph of the Tinker strategy. Its combination of Sol lands and undercosted, yet extremely powerful, creatures makes it the fastest Tinker deck in recent memory (maybe not of all time, however). I realize Sol lands are nothing new, but that kind of acceleration is nothing compared to Eye. Sol lands in Dragon Stompy power out fairly-costed and far less powerful creatures and all have to tap for mana. The fact that Eye enables multiple 2/x creatures on turn one followed by turn two 3/3’s and 4/4’s without tapping puts it in a league of its own. Eldrazi Temple is powerful, certainly, but it’s just a land compared to Eye. This is the source of Eldrazi’s Enigma level power. The Eldrazi lands allow the deck to bypass the traditional weakness of Tinker, which make it much harder to disrupt, and the undercosted creatures let it play Stompy style creatures with a curve Sligh can only dream about. Cheap powerful creatures in large quantities undisruptably in the first few turns? Sounds like The Enigma to me. So what’s the story behind Eldrazi’s metagame share? No deck has achieved this level of dominance since we started tracking metagame data (maybe in Magic’s history. Modern Nexus has no comprehensive data to evaluate this, but Cawblade likely rivaled Eldrazi). Again, I think if we look at previously busted, Enigma level decks and their context we will find some answers. 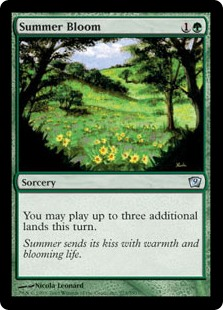 Let’s make this as simple as possible and just focus on the last two banning updates: Splinter Twin, Summer Bloom, Birthing Pod, and Treasure Cruise. These cards enabled very powerful (and, in most cases, busted) decks, but none of them ever held the kind of metagame share that Eldrazi does. To evaluate this, I’ll break down where the decks fell in Flores’ spectrum and their context in the metagame and use this to explain Eldrazi. Pod was pretty clearly a Toolbox deck. Efficient, repeatable tutoring engine? Check; it’s a “fixed” Survival of the Fittest, after all. Selection of silver bullet creatures? Check. Ability to adapt to any situation and win by generating overwhelming board advantage? Check. Toolbox has a history of bannings, with Survival being banned in multiple formats and tutors generally getting hammered. What made Pod unique compared to the various Survival decks was it was never a dedicated Toolbox deck and had several very good backup plans. From Tinker, it had acceleration in the form of Birds of Paradise, Wall of Roots, and Noble Hierarch. From Stompy, it had a solid beatdown plan of (mostly) green creatures pumped by Gavony Township, all of which were integral to the engine. The deck initially existed for years as a good, combo-centric engine with a Township Plan B. What finally pushed it towards Enigma power was it became an overwhelming value engine to power out a stream of Siege Rhinos, often with the threat of a combo in the wings. That simply overpowered every fair deck and outraced most of the unfair ones. Twin is going to be the odd man out here because I’m not convinced it was ever a truly Enigma-level threat. Yes, it had an Enigma level two-card combo but most of the time it floated between Counter-Sliver and Weissman depending on the matchup. Ability to slide cheap threats under opposing defenses and protect them? Check. Potential to answer everything from the opponent? Check. Blue? Check. Twin was always a threat, and arguably oppressive, but it never felt too unfair and lacked the unbeatable, unanswerable power of Enigma. Instead, it played a lot of answers and tried to ride small creatures to victory when there was an opening, very much like the Counter-Rebels deck Flores cited. Again, Amulet Bloom was obviously a Tinker deck. Acceleration into huge threats? Check. Explosiveness? Check. Vulnerability to drawing poorly? Check. The deck accelerated out Primeval Titan and used early Blooms and Amulet of Vigors to generate absurd amounts of mana, sometimes killing on turn two. This pretty clearly moves it into Enigma territory. Although its metagame share made it top-tier in the eyes of Wizards, it was only a small fraction of the Eldrazi insanity we’re seeing today. While the deck still technically exists without the Bloom, the explosiveness factor has diminished to the point that there’s little reason to prefer it over other options. Alright, test time (I warned you). What category did Cruise era URx Delver fall into? Write your answer in the comments, no cheating. It’s Necro. Mana efficient threats and answers? Check (Can’t get more efficient than one mana). Lots of them? Check. Powerful card draw engine? Check. Wins via card advantage and mana efficiency? Check. Delver tapped out every turn, drew tons of cards and possessed a card draw engine to keep the threats and spells flowing. Clearly Necro. It was the sheer efficiency and speed of the deck, thanks to its operation fueling and finding Treasure Cruise that pushed it firmly into Enigma level power and ultimately the banned list. Of course, URx Delver wasn’t the only home for Cruise, but it is the one that abused the engine most effectively (sorry Jeskai Ascendancy, you just didn’t cut it) and was ultimately the primary reason for the banning. Here’s the thing about all these decks: they existed alongside each other (yes, even Bloom – that deck had been around for at least two years before Justin Cohen’s breakout performance at Pro Tour Fate Reforged). That’s three definitively Enigma-level strategies, and one Wizards at least felt was Enigma. It is reasonable to assume they kept each other in check to some extent (certainly true of Pod vs. Delver and Twin vs. Bloom, and arguable for the others). Furthermore, if you didn’t like one of these strategies there were other, equally powerful options to choose from, which meant there was no incentive for everyone to play the same powerful deck. With Twin out of the picture, there isn’t another deck that can really claim the Enigma mantle since the decks that remain are either highly disruptable or too fair, which means, for one of the first times in Modern history, all the Enigma power is concentrated in one single deck: Eldrazi. Of course, this isn’t to we need more broken decks (by its own definition, Magic is better off when there is no Enigma). Rather, it’s to acknowledge we’re in a weird place where the known Enigmas were all gone and if you want to play that kind of game there’s only one choice. You can play varieties of that theme, but nothing equal to it. The other thing about these previous decks is there was space around them. They stuck to one or a few archetypes and when there was bleed it was low, especially compared to the Eldrazi core straddling three very different strategies (even more, when the various flavors are all taken into consideration). In the Cruise era, it was possible to go Stompy on Delver with Death and Taxes and constrict and disrupt their mana enough to keep the Necro gameplan in check. It was possible to shut down Pod’s tutoring engine. Twin kept many other, far more broken decks down by forcing them to interact or perish. Because Eldrazi does so many things and does them faster than the decks that normally occupy those spaces, it has stolen archetypal space that would have otherwise existed. Thus, in order to fight back, we need to look to other achetypes that Eldrazi can’t touch to find room to win. In other words, Eldrazi arose at exactly the right time in exactly the right form to be incredibly overpowering. If Pod, Twin, Delver, or Bloom still existed in their unbanned form, there would be some incentive to play another deck at that powerlevel. As is, you must either play the deck or target it, the true mark of a truly dangerous Enigma. As Flores noted, there’s not a lot you can do against Enigma except try to target it. Unfortunately, since the broken part of Eldrazi is its lands, that is very hard to do. With an emergency ban not in the cards (rightly, I might add), we need to try and adapt to the problem. Toolbox and Counter-Sliver strategies have considerable value against Enigma, as Jeff Hoogland and Aaron Reed showed, so if you’re not playing Eldrazi that’s where I’d start instead. In many ways, I think Wizards is a victim of its own success. It has spent every banning since Modern’s inception trying to remove the known Enigma level decks and it finally succeeded in time for another one to swoop in and dominate without a comparable deck to oppose it, or proper regulatory cards to manage it. According to multiple sources, Wizards doesn’t look for new Modern decks when they develop new sets (they just test Standard), this looks to be just another case where Wizards made a mistake and it will be corrected in due time. Hopefully, now that you understand the source of this menace’s power, you will have the tool(box) to contain it. Or at least hold back the tide until rescue comes in April. Good luck, and if I make it to Detroit I will let you all know how successful I was. In the meantime, I’ll be grading your responses in the comments. This is a well thought out article, although I disagree with some of the analysis, I agree with most. However, I think the term broken gets overused in the magic community. Too much hyperbole. Eldrazi is clearly incredibly strong. The combination of speed, disruption and aggression is very powerful. I would offer an alternative analysis – perhaps Modern itself is “broken”. For any format to be healthy, there needs to be checks and balances. Combo, aggro, control, etc. Think of it like the holy trinity in an MMORPG (heals, dps, tanks). If you are missing some, the whole format itself is lacks balance. So, where are the Weissman decks in Modern? It certainly wasn’t Twin, that deck did not overload on control at the expense of everything else and it definitely could not answer *anything*. It played the tempo game well. You could argue for Jund, but I’m pretty sure I could counter that argument, because Jund doesn’t really want to play a pure control game. Its also not Jeskai “control” or w/e. Prison decks are close, but those decks are awefully slow for the current speed of Modern. Answer? There aren’t any. There also are very few of some of the other archetypes in Flores’ article. And the reason for this is that Wizards has decided (through a combination of bannings and new printings) to slow down card draw and and permission and combo, while simultaneously printing faster aggro and disruption, to the point where those methods can no longer enable effective checks and balances. We are left with a format mostly of Eldrazi, Affinity, Twin, Burn, etc (going back to our analogy, all DPS). And in such a meta, the only solution is to play the strongest / fastest (Affinity or Eldrazi). I don’t think any of those decks are truly broken, but I believe the format might be. Until someone finds a way to make a viable control deck (and no, 4 mana wraths and conditional counterspells won’t cut it), or a combo deck with the speed and consistency of Eldrazi, the format will be incredibly unbalanced. And even if Eldrazi gets the ban hammer, I’m not sure it will be enough to restore that balance overall. Modern is in a tough spot. I disagree that Weissman doesn’t exist in Modern, but it has taken a different form than we’re used to. Like I said in the article, Twin was never a *true* Weissman deck, nor is Jund, but they both have the ability to play like one sometimes. The fact that they switch roles depending on the matchup puts them between Counter-Sliver and Weissman. They may not be the best at either role, but their flexibility frequently made up for these deficiencies. Jeskai Control, on the other hand, IS Weissman and would be viable were it not for the colorless menace. Overloads on answers? Check. Few win conditions? Check. Card advantage? For the versions that run Sphinx’s Revelation at least, check. Prior to Eldrazi I was seeing this deck in paper with increasing frequency and it had success, particularly in an Infect, Burn, and Affinity heavy meta where its answers lined up well. It could be viable again once Eldrazi are gone. Where Weissman decks of the past could sit on countermagic and wraths, Jeskai takes some pages from Necro’s book and runs efficient proactive 1 for 1 ones and separate card advantage (cantrip answers and Rev) to keep them flowing. If, as Forsythe has suggested, Ancestral Recall is being considered for unbanning then we may see Jeskai take a more traditional Weissman role. It’s true that Ancestral Visios might even be a bit slow, but I think Ancestral Recall would perhaps be too much for modern 😛 I feel it works too well with Snapcaster. Snapcaster doesn’t interact with Ancestral Recall at all. It has no casting cost, which is different than a 0 casting cost. As far as I know, Ancestral Recall costs one blue mana. Great article! I loved the callback to things we knew but forgot. Man, the days of Tinker bring me back to my childhood when I just started playing! It would consist of Eldrazi, Twin, Pod, Bloom and Delver with Affinity lurking around the edges, and if the no-banlist tournaments I’ve seen are any indication then Pod would be fighting for the top slot with Eldrazi. The amount of Enigma level power would be so great (if it weren’t for the powerful hate Affinity would be Enigma) that you’d play a now-banned deck or lose. It might be *better* than it is right now, but I still wouldn’t call it healthy. Fair assessment! I suppose that my point was that, out of the cards eligible for the Modern format without bans, Eldrazi is a local maximum and they can either push the power levels around with bans or print new cards. Enigma is only Enigma when it doesn’t have any competition for that Enigma title, right? Kind of. I think of Enigma as a power level more than an archetype, but the article does imply that your assessment is correct and that if everything is Enigma then there is no Enigma. Regardless, having multiple Enigma level decks would be healthier than just the one, though that’s not optimal for Modern and against what Wizards (and I think most players) want for the format. As a player currently in a No Banlist Modern league I can say a few things on the matter. One is this: Eldrazi isn’t that good at interacting. This means that the deck, while a powerful deck, has little to no gane against the best combo decks like Blazing Shoal Infect and Hypergenesis. A better affinity also destroys the Eldrazi menace. Secondly, fair magic so far has shown to rule the meta. I’ve yet to lose a match so far on Twin while Miracles, Stoneblade, Elves, and Tezzeret Control all have seen a decent amount of success. The big mana deck in the format is none other than 2011’s PT Philly monster cloudpost. Turns out amulet bloom is a solid little package in the hyper ramp deck and a turn 3 emrakul is nothing short of normal for a deck boasting Through the Breaches and Prime Times. In fact after weeks of testing I almost played a Gruul Post deck featuring Inkmoth Kessig Wolf-Run. Combo still crushes this deck as a turn one Hypergenesis or a turn two Blazing Shoal can punish a deck like Post that does take a turn or two to set up. Finally, the metagame has balanced itself. Some cards have proven themselves way too good (see Mental Misstep) while others seem too slow (yes Jace, I mean you), however; the format as a whole has been quite fun to play and the meta remains quite diverse. Wish me luck as I continue and may we all brave Eldrazi Winter together! This is a good article, and its historical perspective increasingly points me toward the conclusion that perhaps this is a Legacy deck that got foisted into Modern by an under-estimation of the potency of fast mana (it couldn’t have been that WotC forgot that Eldrazi Temple and Eye of Ugin existed – they reprinted them for Modern Masters, after all). Combine that with the lack of a true Weissman control toolbox (as Nick Morizio noted), and it’s somewhat understandable how this all got out of hand. The GPs will be the true test of whether the deck is too potent for Modern, but even I’m now willing to admit that it doesn’t look good. The occasional Affinity/Abzan Company/Infect/Merfolk deck can crack through and make a showing, but by and large it’s a wave of Eldrazi right now, and the archetypes seem to be innovating solutions to every potential problem we throw at them. I’m going to keep trying my best, but it’s hard to deny that they’re dominating the format (and even starting to carve out a niche for themselves in Legacy as well). In fairness MUD was already a deck and the Eldrazi are simply better MUD creatures so it was inevitable that they’d find their way into Legacy, where they will be better contained thanks to Wasteland and Force. Since Wizards only tests Modern decks they already know about and they design sets years in advance I don’t think they knew about the Eldrazi deck in any form until we did, which means that the Masters decision was likely a case of “Oh, here are some cards that play well with a new set, lets make them more available.” Foolish perhaps, but understandable given their time and resource constraints. Could you give an example of a Necro deck in Modern, so I get better understand it? I’m thinking the old Grixis control lists, before it became blue jund. Grinding out incremental card advantages and using delve for superior threats. Would this be accurate? Not exactly. The classic Necro deck was black aggro with Necropotence to keep its hand full and the answers flowing (archetypical deck here: http://tappedout.net/mtg-decks/necro-17-02-13-1/). The only deck that really matched this recently was Treasure Cruise Delver. The lack of card advantage and tendency to play early threats and protect them would put Grixis in Counter-Sliver (compare to the Skies deck in the article) though many of them lean heavily towards Weissman. Current Delver lists embody the spirit though not the actuality of Necro due to a lack of card advantage, though Ancestral Visions might change that. I like how all of the content on this site is of an academic style; rigorous/cogent arguments and application of theory. Perhaps my memory is failing me, but someone should consider writing an article about how theory needs to be understood as a means of solving problems by adopting a novel perspective of an object of inquiry, rather than a description of objective truth about the game’s nature. Counter-Sliver decks that move away from creatures (and far away from creature synergies) in favor of a few, stand-alone power threats and more stack interaction are called Grow decks. Super-Grow is a Grow deck that “breaks” because of the introduction of a hyper-efficient card advantage engine. We’ve seen it happen to other Grow decks, and they also historically have a precedent set for bannings. In the past, Super Grow decks in Extended and Vintage have been neutered with the removal/restriction of Gush. For any Vintage players out there, you probably remember what the format looked like when Cruise reigned supreme: UR Delver decks with 3-4 Cruise and 3-4 Gush sat happily at the top of the metagame, riding a Necro-level card advantage engine to Enigma-level status in a Grow-aligned Counter-Sliver shell. Its tough to categorize the Eldrazi deck as Tinker, IMO. It doesnt have any of the traditional ramp cards, like Birds, Moxen, and Elves, NOR does it have any traditional ‘cheat’ cards, like Tinker and Natural Order… It is truly just an Enigma deck. I dont think an Enigma deck needs to be some other category in addition to Enigma. The power of the deck comes from that it simply plays on a different axis. From a Legacy perspective, all their lands give you 2, so you have to look at their creatures as just absurdly under-costed. Mimic is a 1 CMC, TKS is a 2 CMC, and Smasher/End Bringer are 3 CMC. Once you take a step back and realize a card like Thought Knot Seer is a 2 CMC creature, you get blown away at how too good it is. Every deck would play TKS for 2, if they could. Whoever decided that every instance of old lands should produce colorless mana instead of generic mana is a dumb dumb, and that is the real problem. They even changed it all visually online, which looks ridiculous. Not only did Wizards create a 6th color out of their asses, they gave it the best mana available. Its not like blue has access to a UU 2 damage land like Tomb. There used to be Academy, but that was deemed too good. Just mind boggling. Um, they’ve produced colorless mana for years. There’s no such thing as producing “generic mana.” “Generic” only refers to costs, not to mana. This is already how the rules worked long prior to OGW. Literally nothing changed. My point is, colorless mana used to be a drawback, but it clearly isnt when you introduce Colorless as a color. So, Wizards could have done whatever they wanted with how the old lands operate, but chose to have them fuel these ridiculous creatures and spells. Where is my UUU artifact like Grim Monolith? Or UU land like City of Traitors? That is the mechanic that broke Modern and will storm into Legacy. You can give any color 2 mana lands and they would also be fantastic, obviously, even the new ‘color’ Colorless. Artifacts have had this advantage for years, but there is plenty of artifact hate. However, even with that hate, Shops is busted in Vintage. If you look at what the Tinker deck was trying to do rather than the tools it uses then Eldrazi is clearly fits. Tinker wants to play large, impressive spells much faster than they “should” be. To do this it historically used cheat cards and acceleration. Edrazi is playing impressive and large creatures much sooner than it should be, using acceleration provided by lands. As I said this bypasses the traditional Tinker vulnerability to bad draws and counters, which is why it doesn’t look like a Tinker deck “should” look and why it is so powerful. I wish I could have explained it as well as you have here, but this is why I have been adamant about the deck being broken. Once you play against and with the deck for a while, these things become obvious. I’m glad Nexus is breaking down eldrazi like this now: research based, rigorous and not forcing me to accept Eldrazi as just another fair deck in the modern format. This kind of article, that really breaks down eldrazi to show where it derives its power, without silly and trite urges to calm down and just get better at magic nonsense. Also, clearly why the correct ban is eye not temple. Been saying this from the beginning as well, glad you are seeing the same thing. Lastly, eldrazi is far from broken in legacy. Been playing the deck for 4-5 hours daily for the last few days. It just goes to show how much generic answers can slow down this archetype. Curiously, I did not do any research at all for eldrazi except watching Andrea mengucci video on channel fireball. I tinkered with the deck and came up with a lost that very closely matches 5-0 lists i looked at after the fact. It just really interests me that deck ideas can converge so much after testing. i thought I found niche cards to answer problem matchups and they were the same as in other lists (Karakas for show and tell, new kozilek for grindy matchups for example). Also, even crazier that this is the first time I’ve actually played legacy, and still got to the same choices (though to be fair I have been watching and reading a lot about legacy recently because I’ve been dying to get into it). Legacy is actually super cheap on mtgo if you are already heavily invested in modern. Solid article David, and great that you are producing theoretical material like this- but I have a bit of bad news for you. This article is redundant, as you were beaten to the punch, badly, by…Mike Flores (!). To summarise, Eldrazi gets not only an unfair mana advantage from Sol lands, but a card advantage too. 2 mana costs 2 cards under normal rules. Further, the utility lands mean they don’t truly flood out in most cases. Chapin says something like “Eye is secretly an Ancestral Recall that draws you a black lotus every time”. This low level analysis of the situation explains why even the wild varieties of the deck now are still just as busted as the more pure ones – the cards don’t actually matter.